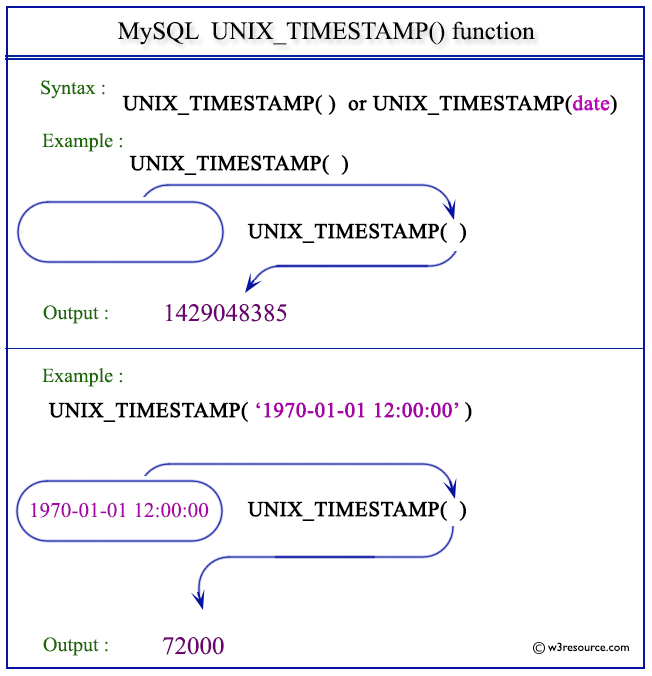 MySQL UNIX_TIMESTAMP() returns a Unix timestamp in seconds since '1970-01-01 00:00:00' UTC as an unsigned integer if no arguments are passed with UNIX_TIMESTAMP(). When this function used with a date argument, it returns the value of the argument as an unsigned integer in seconds since '1970-01-01 00:00:00' UTC. The argument may be a DATE, DATETIME,TIMESTAMP or a number in YYYYMMDD or YYMMDD. Note: Since UNIX_TIMESTAMP() works on current datetime, your output may vary from the output shown. The following statement will return the unix timestamp in seconds as an unsigned integer since '1970-01-01 00:00:00' UTC. The following statement will return the unix timestamp in seconds as an unsigned integer since '1970-01-01 00:00:00' UTC for the specified datetime 1970-01-01 12:00:00.